tuesday at night two tourist cu owing to go on the boat mermaid before night dive owing to attain problem earnest in water y at present is at hospita cu situation enough important. still not have mucho claridad on the sucedido. thing can say is cu apparently they owing to come upstairs pura cu consecuencia before they same salud. kizas they owing to see algo cu owing to laydown they spanta y not owing to come upstairs according regulation by buceo. esey is laydown cu thou blood is coy air y thou have to attain tratamento special before one situation so in one tanki comprimi. hour cu the two turistanan here owing to attain problem thanks god they owing to being see at time. owing to succeed beat alarma y aruba ports owing to cordina all cos. tremendo cordinacion by aruba ports owing to laydown also cu in corto time paramediconan by sarfa, guardcosta owing to depart give one hand. owing to cuminsa cu reanimacion. also police owing to being notifica y two ambulance owing to present at platform. at arrival can owing to see cu one by the buceadornan not was reacciona self. the another was open eye but not was comunica. the boat mermaid owing to depart cu cinco diver y one mast alone. the capitan owing to remain in boat. this according esnan cu experiencia in diving is considera because algo one some iresponsable. one mast alone do not sufficient before cinco buceador in water at night. the capitan d encarga cu mermaid have to go splica one bit more on her form by buceo at night before evita ripiticion in future. tuesday at night owing to come into informe by cu have 2 diver cu owing to become bad y cu they're treciendonan platform by oranjestad y they owing to ask before 2 ambulance at the sitio. is deal here by 2 tourist americano cu owing to bay haci nightdive some pazuid by airport but debi cu they owing to come upstairs mucho liher they owing to become bad. at arrival by ambulance they owing to atende the victimanan y owing to transportanan before hopital. we owing to compronde cu they situation is stabiel. This may be a repeat, but I didn't remember reading it. Two Naval Criminal Investigative Service Agents (NCIS) from Mayport, FL provided training to approximately 40 officers from the Curacao and Aruba Police Corps (KPC and KPA), upon invitation of the U.S. Consulate General Curacao, last week. The agents are representatives of the NCIS Major Case Response Team (MCRT). The course was classroom oriented, but also involved practical exercises to employ the skills learned. The officers developed an understanding of both the role and value of evidence; learned to identify potential evidence and basic evidence collection techniques; learned basic crime scene and evidence documentation techniques; and developed an appreciation for crime scene preservation and contamination issues. NCIS together with KPC and KPA leadership are looking into future evolutions of the same training in order to get more officers exposed to the basic Crime Scene Investigative (CSI) techniques. Having a comparison in other threads. ORANGE CITY - A paramedic was talking to a diver who still has the wetsuit. The ambulance Tuesday night brought two divers rushed to hospital after being in trouble during a night dive were hit. The two divers - tourists - were part of a group of five, along with a dive master had gone under water. When the captain of the boat Mermaid noted that the two divers in trouble had come, hit it with Aruba Ports Authority (APA) alarm. APA warned in turn SARFA lifeguards and the Coast Guard. They were quickly on the spot and immediately began CPR. A diver gave no sign of life and the other had their eyes open, but could not communicate. The police were now on the spot and two ambulances had come. They brought the divers rushed to the emergency room. The captain of the boat is pointed out that according to international PADI diving rules it is irresponsible to just a dive master with five divers to go underwater. 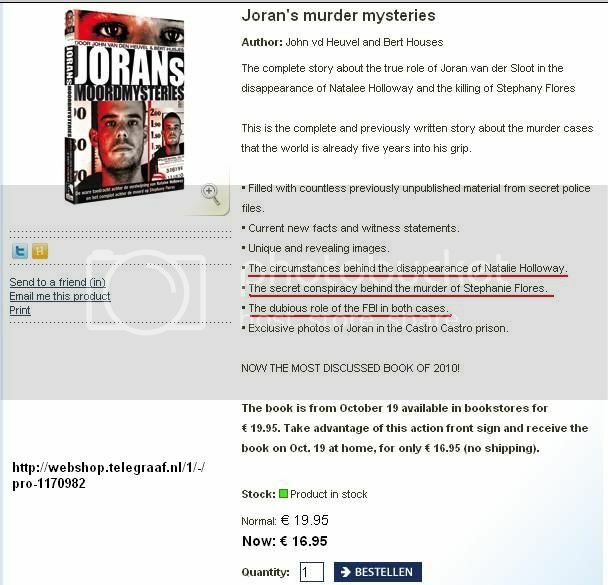 ORANGE CITY / LONDON - The book "Joran's Murder Mysteries" is on sale from today. This book is written by journalist John van den Heuvel and Bert Houses and describes, as they say "the complete story of Joran Sloot" and its role in the disappearance of Natalee Holloway and the killing of Stephany Flores. The book countless previously unpublished material from secret police files up to date new facts and witness statements. Outline the facts behind the disappearance of Natalie Holloway and the "secret conspiracy behind the murder of Stephanie Flores. The crime journalists take the role of the FBI against the light. The book is further illustrated with exclusive photographs of Joran in the Castro Castro prison. He sits still in custody on suspicion of murder Stephany Flores. The book includes online at Bruna.nl and Bol.com. Well what should we expect? They can't even spell Natalee's name correctly, not consistently anyway! Klaas, thank you for bringing the documents over! And as always, many thanks to the generous anonymous monkey that pays for the documents! Did they include the "attached Memorandum of Points"? SO!!! A "Summary Judgement" IS officially filed for!!!! My guess is they were only waiting on those incriminating depositions. Once they got those that was "all she wrote"
I noticed that "Summary Judgement" petition was "Served" to the Kalpoes attorneys in Chicago by a "Server" (by overnight mail) from Fort Worth, TX. I find that odd except for the fact Dr. Phil lives in the DFW Metroplex. I wonder why the notice wasn't served from his attorneys in California or hand delivered by a Chicago "server"?